I've recently used this mob and they were quite responsive and their website had teh breakdown pics to make it easier to find the part number I wanted. I ordered a new LH Mirror Cowl, Mirror Cowl Spring, LH front indicator, RH roll-over bar cover complete and an assortment of tupperware clips. All delivered in just over a week. Prices all very reasonable. I've used them too via the Internet and telephone and they were great. However I called in to see them on the way home from Middleton and they were less than helpful. Maybe some people can only communicate over the phone or Internet. The whole buy on the internet is a real quandary. I like to know there is a local Honda dealer to shop at but some of Mr Honda's prices are hard to accept. I have just used Blue city motorcycles & will not be using them again. Purchased radiator hoses & what i thought was a 4 pack of hose clamps. Turns out it was $13 for 1 clamp , not 4. I will return to my local STealership for parts as a temporary fix until i can find somewhere else. A quick visit to supercheap should get me the extra clamps for a few $$$. $13 for 1 clamp , not 4. I need to replace the right hand lower cowl on my 2008 ST1300A (damage caused by a minor "off" on a sandy track at the back of Halls Creek). This is a relatively minor bit of plastic in a generic grey colour so you can imagine my reaction when Hawesbury Honda quoted me $475 for a replacement!!! Blue City seem to be quoting $411 for the same bit (plus transport I guess) so still a pretty big slug for a nondescript bit of plastic. Anyone had any experience at getting fairing bits from O/S sources? If you can find the part number you need that would make it easier. I got my parts from there when I did my timing belt and cooling system and even with postage it was still cheaper than local. Just a matter of camparing prices inc postage seeing which is best for you. 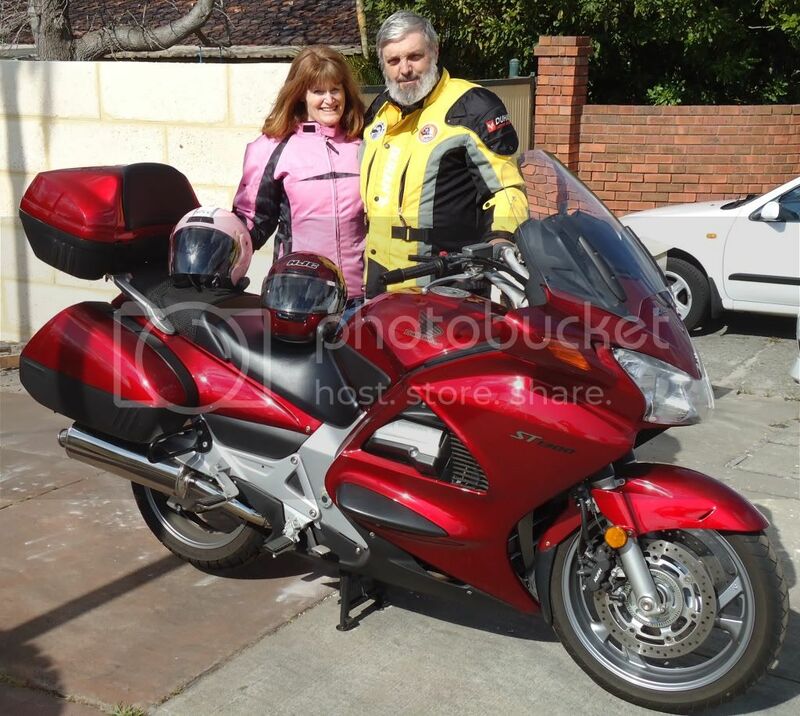 I just ordered the Cowl from MRCycles in the US @ A$260 delivered to Oz. A bit better than the $411 plus delivery from Blue City. Probably a bit of a gamble but worth a try. I will let you know how I go. Arrived today no problems - Exactly the same part ex-Japan if sourced from Australia but comes via USA for $200 less than the local supply. Makes you wonder!. Thanks for the tip Alan. They say money cant buy happiness, but i say it can get you a damn good bike! Any body know where i could get an aftermarker rear seat from. I have just purchased an ex police bike and would like to have a rear seat. i have found some on Ebay but there like $500 for both, im only looking for the rear. I've just purchased a Sargent seat set from "csg", but haven't picked it up yet. Give us a bit of time to test it on some long hauls, and if the new seat suits us, my old OEM seat may come up for sale. Stay Tuned! I would not recommend Bluecity Motorcycles. I ordered a small fuel pipe from them paid for it, and waited for it to arrive for 6 weeks. I received an email telling me that it was on its way a month ago. I emailed them a week ago to see if they could shed any light on why I didn't receive it. They haven't bothered to reply. I have re-ordered it from another dealer. Luckily it was only a $10 part. I ordered two (bar) weight ends and two socket bolts on the 27th of September. I received my parts from Blue City Motorcycles only last week. Partly their fault - partly Aus Post. They took 14 days to get the parcel to me. A happier camper now, but wary of who I deal with from now on though, and certainly not likely to recommend this mob. On the 26th October I posted on this site that I would not recommend Bluecity Motorcycles, after waiting 6 weeks for a part I had ordered. They sent me an email in early October telling me that the part had been posted. I never received the part. Well, another one arrived today by express post along with a complimentary Honda coffee mug posted on 30th October. I can only assume they saw my posting on Ozstoc and have done the right thing and replaced my order along with the mug. Thank you, Blue City Motorcycles. Now if all the Honda dealers checked in here once a week they'd learn a lot about the way owners think which might help them improve their business.